Bring fire to the battle with Charmeleon! Pokémon Trainers can get fired up for the battle with their very own Charmeleon! Build your Pokémon, and get it ready for the fight, flaming tail and all. 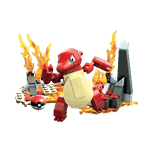 Then help unleash a Fire-type attack with the buildable, transparent battle effect details! Charmeleon comes with a buildable fiery environment and authentic mini Poké Ball!